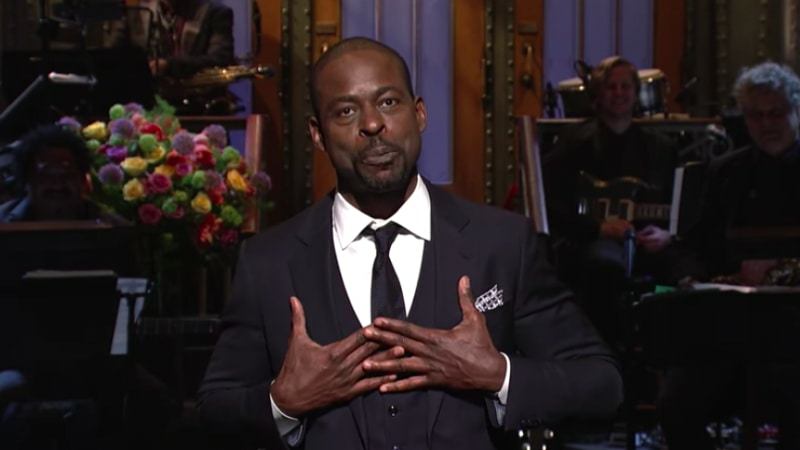 Sterling K. Brown has a lot to be thankful for, something that he made note of Saturday night (March 10) while hosting an episode of Saturday Night Live. From making history as the first Black actor to win a Golden Globe for Best Actor in a TV Drama to becoming the first Black actor to win a SAG Award for Outstanding Performance by a Male Actor to winning over audiences with his performance as Randall Pearson on NBC's This Is Us to appearing in Black Panther, Brown has been having an impeccable run. The actor took to SNL to celebrate, as well as reflect on the past year during an emotional opening monologue. "Most of you probably know me from This Is Us, which is the saddest thing you can watch on TV other than the news," he says. "I have a reputation for being pretty sensitive, what can I say I'm an actor, I wear my emotions on my sleeve. I promise tonight I won't get overwhelmed… It's SNL you know. I mean, how lucky am I to be here, and on top of everything I've gotten to do in the last few years, it's just like the icing on the cake." As he hilariously fights back tears and continues to give himself a pep talk not to get too emotional (all while getting too emotional), Leslie Jones comes out to help him get it together so they can get the show on the road. Throughout the episode, Brown helps the cast parody a Trump-style edition of This Is Us, a rendition of Family Feud: Oscars Editon (shouts to Common!) and a deleted scene from Black Panther, as well as participates in a sketch playing a fan of the movie Shrek who got upset at this year's Coco win at the Oscar's, among others. Take a look at Sterling K. Brown's opening monologue and the standout sketches from the episode, below.